While scandals with cheap apartments continue to shake the power, others, also empowered by the ruling Citizens for European Development of Bulgaria (GERB) party, have resolved their housing needs in another creative way – buying farmland in a good location and illegally building on it. 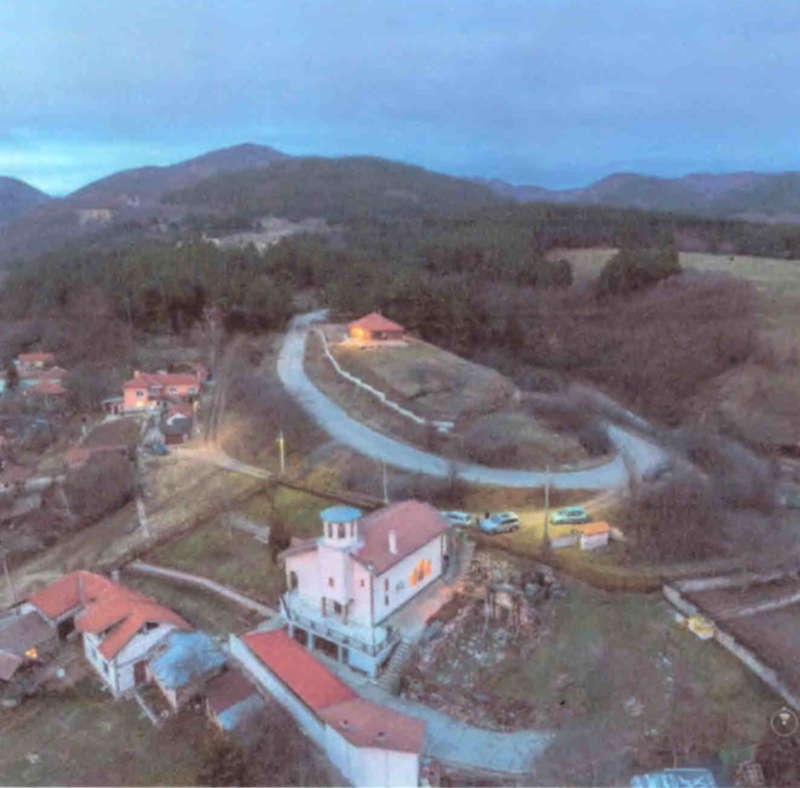 This emerges from a reference about a property at the end of the village of Seslavtsi, Kremikovtzi district, near the capital Sofia, which belongs to Sofia’s Deputy Governor, Tommy Nikolov, and his wife Ivelina Dzartova, a member of the Sofia Municipal Council, both from GERB. The neat cottage, perched on the green hill, should not be there, according to all laws and territorial planning, but it is a fact as seen on the headline picture. At the same time, the status of the land remains farmland, shows a reference in the Cadaster. According to the current Sofia City Master Plan for this property, it is allocated for landscaped terrains and construction works are not permitted, except for engineering networks and alleys. However, the residential building, which has been built there, can hardly be equated with engineering infrastructure. Precisely the status of this land, which, as seen from the pictures and the satellite map, is on a hill at the end of the village, makes its price ridiculously low compared to other terrains in the Sofia suburbs. On November 24, 2009, Nikolov and Dzartova had bought it for only BGN 700 from a private person. The Deputy Governor of Sofia, Tommy Nikolov, “rose to fame” over the scandalous sale of the former King’s stables. However, privately, the property acquisitions of Nikolov and members of his family prove to be very large. The origin of the most lucrative of them is in questionable swaps with the Sofia Municipality, while Tommy Nikolov occupied a powerful position there. From 1999 to 2007, Tommy Nikolov was Regional Mayor of the Kremikovtzi district. As early as 1999, he and his ex-wife bought from the Municipality an apartment in the “Hadzhi Dimitar” district for BGN 7,000. In 2004, Tommy Nikolov’s son Alexander was included in the list of those who are in extreme need of housing in the Kremikovtsi district where his father was the Mayor. Two years later, the son Alexander moved into a municipal apartment of 87 square meters, but not in the more distant suburb of Kremikovtzi, rather in the very heart of Sofia, on 19 “Iskar” Street in the downtown of the Bulgarian capital. A year later, from a very needy tenant, he became the owner of the apartment for just BGN 27,000. The latter is baffling because according to the municipal regulation he must have been a tenant of the municipal property for at least five years before he could buy it. At that time, the current Prime Minister and leader of GERB, Boyko Borisov, was Mayor of Sofia. Only a year after the profitable property acquisition, the boy no longer had housing needs and he donated the apartment to his father. The father has sold it for BGN 234,000, which is a 1,200% profit. A real hit is also the swap of Tommy Nikolov’s brother – Mariyan Mladenov. He has given to the municipality two apartments in the Botunetz suburb against a property in the village of Krivina, close to the beltway. Mariyan has then sold part of the plot to Gazprom to build a gas station for EUR 600,000, and the other part he has donated to his brother Tommy. The scheme also includes Tommy Nikolov’s parents, who have acquired municipal terrains for pocket change in the Druzhba district and have donated them to their son. Last year, the Deputy Governor of Sofia sold to the company “ZHSP Style” the right to build a new five-story residential building on one of these donate sites for BGN 675,218.